Roseville Self Storage at 100 Junction Blvd. Located at the corner of Junction Blvd. and Washington Blvd., Extra Space Storage serves Roseville residents near Diamond Oaks, Los Cerritos, Sierra Vista, Pleasant Grove, Enwood, and Harding. Locals will recognize our facility across from ARCO and Unity of Roseville. We're also accessible for residents of nearby apartments, such as Quail Ridge Apartments, Sonterra Apartments, Canterbury Downs, Autumn Oaks Apartments, Allegria at Roseville, and Woodcreek Terrace Apartments. Extra Space Storage on Junction Blvd. 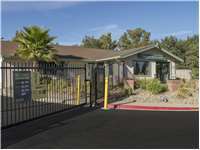 offers a large selection of storage units, as well as amenities like vehicle storage and exceptional security. We're the self storage solution you're looking for in Roseville. Our Junction Blvd. storage facility has storage units as small as 5x5 and as large as 10x30 with features like indoor access, first-floor access, drive-up access, and outdoor vehicle storage. Need to store a car, motorcycle, boat, or RV in Roseville? Extra Space Storage offers 10x20 to 10x25 outdoor parking spaces and 10x10 to 10x30 drive-up units can accommodate vehicles of all sizes. Extra Space Storage strives to provide a secure storage environment for customers. With an on-site resident manager, 24-hour video surveillance, and electronic gate access with personalized entry codes, you can rest assured your belongings will be safe at our Roseville storage facility. At Extra Space Storage, we're committed to providing great customer service. You can expect our facility to always be secure, clean, and well-maintained. Have questions? Our friendly, professional staff is more than happy to help. Contact us today to reserve a storage unit in Roseville! The Roseville, junction Blvd location has an awesome manager Michael who is up front and informative . The unit is clean and easily accessible . Love it. Been there for years with both an outside space for our trailer and an inside space for other items. The staff and the property and the rates are outstanding. Thank you. This was my top pick for self storage, because of all the reviews, and I'm glad I went with them! The facility is so clean and well kept, the staff is extremely nice and helpful, and they made the whole process so easy! Thank you Extra Space! Great price Great Location and Great service! Thank you Extra Space Storage! So far it has been a nice and pain free process. Very clean looking facility that is also secure. Since I’m not from here, but moving here. I had to rely on my kids referral. They loved the location. Said it was super clean and near police department! ???? I called and their prices were lowest. Went and checked out facility. Super clean. The staff was very nice and easy to talk to. Didn’t feel rushed at all. Very easy going experience! ?? Constantly raises your monthly rate, can't access the dumpster-it's always locked, bathrooms are always either out of paper or soap, manager not very friendly. Laura and Mike made the difference, I had spoken in person and over the phone to other companies who were impersonal, unhelpful and disinterested in what I was saying. Laura talked with me and took the time to go over options that might work for me even when I was just looking and inquiring . I went back to her when I was ready and they happen to have two units side by side, Mike took me to look at them, and they were both such a great team and made me feel like my belongings are in the right place, VERY IMPORTANT!! They acted like I was doing THEM a favor!! Loved the whole experience with them! First off moving is a drag however renting from extra space storage made it extremely easy and convenient to move . I current rent from the Roseville location and it has treated me well and storage facility has been kept clean in and out of storage units . The staff is amazing and always smiling and always willing to lend advice. They go above and beyond to satisfy their customers. I will highly recommend extra space storage to family and friends ! I have had a great experience using Extra Space Storage. The unit is clean and well-lit and the price is reasonable. What I am really impressed by is the staff. Very accommodating, helpful and friendly. They went out of their way to show me the unit and took their time explaining everything. I am very happy with my choice of storage company. I needed a safe place for my items and it has been great so far! I have been with your facility for several years now. I visit frequently sometimes 5 or 6 times per week. The facility is always immaculately clean and I cant say enough about your employees at the Junction location. As a senior I apprec. so much when they check on me just to make sure I am okay. It really means a lot. The bathroom is always super clean and since I am there often I have also noticed how professional they are with new potential renters when they tour them around the facility. Pls pass on how much I apprec their concern for my safety and well being. Great facility...KEEP UP THE GOOD WORK. Went online and found an online only deal at the facility. I called and they gave me the better rate. This facility has great service, the manager is welcoming and helpful. The location is convenient and away from traffic path. Pretty satisfied with the service and it's a safe place. However, the unit is not dust proof. Besides that, everything else is great. All day on a Saturday I called 5 local storage facilities. Just the voice of the person who answered the phone - tired, nonchalant, indifferent- was a turn off. When I called Extra Storage the person who answered the phone was alive! Cheerful and informative, didn't rush me and answered all my questions. When I got there, the customer service was great again. They had to sweep out the unit and did a great job at that too. The location is convenient to where I live as well. The property is clean and well lit. Security is tight with lots of cameras. Ample parking (in the shade) and they sell boxes and padlocks with 2 keys! I would recommend to a friend. Thank you. The customer service is great and I have had nothing but good experiences with the company/facility. Good personal attention and clean facilites. Convenient location with no issues with security. Good hours of operation. Our choice of this facility was based upon size rental price, cleanliness, necessary security features, and convenience to our home. The storage facility met our criteria. The staff were very helpful and available throughout the rental process. We recommend this facility. We shopped around and found the best value for a unit that met our needs. The facility is available 24/7 and the unit is lighted. Our unit is accessible through a large pull down double door. Was easy to get in and out of the facility, service was always very good, courteous reps. Notified us via e-mail of payment and billing. No complaints, if needed would use again. My major complaint is that right after renting a unit I return to find my locks cut and that there are no cameras to see who did it. Only 1 camera at office entrance so I don't feel 100% about the safety of me or my belongings. I find it easy to enter and exit as well as park next to my storage units. The management staff are very helpful and friendly. Intersections/Landmarks: Across the street from ARCO Gas Station, Roseville Police Station and Roseville Fairgrounds & Racetrack Directions from the North: From Rocklin take I-80 S.- exit Douglas- right off exit onto Douglas- merge right onto Judah- right onto Oak St.- left at the roundabout onto Washington Bl.- then right onto Junction Bl. Our facility is on the left-hand side, Green Building. Directions from the South: From I-80 east- take the Riverside exit. Take 1st left onto Cirby. Take right on Foothills. Take right onto Junction and follow to the end. Our facility is on the left-side right after you cross Washington Blvd. Directions from the East: From Rocklin take I-80 S.- exit Douglas- right off exit onto Douglas- merge right onto Judah- right onto Oak St.- left onto Washington Bl.- then right onto Junction Blvd. Our facility is on the left-hand side, Green Building. Directions from the West: From Lincoln take highway 65 south. Take Washington Blvd. Towards the Roseville fairgrounds. Turn left onto Junction Blvd. Were at the corner of Washington and Junction on the left-hand side.